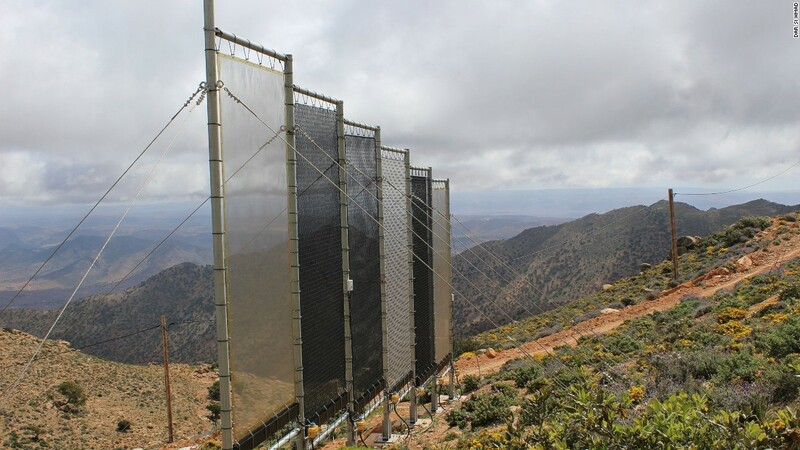 HARVESTING water out of thin air. There is plenty of moisture in the air, if not underground. Air currents circulate this moisture all around the World. As water evaporates and forms a part of the water cycle, fog is created. High up in the hills, this serves as a valuable and pollution free mode to tap drinking water. Once collected this can be transported effortlessly to the valley below by way of gravity. The other way is to to maximize availability is to use the available water resources very wisely. The third is to tap into and save rain water underground. This can be collected and held in huge tanks around each dwelling. There is moisture present in the air in the driest of deserts. Animals and plants have adapted to survive even here by creating ingenious ways in tapping fog. So why can’t we? Use a large net with zig zag channels to collect the fog. Construct large Water banks near each home to tap natural water from rain and fog, even snow melts. Most roofs are sloping. Channels can be focused to a point of collection. A charcoal filter can be added to the system. This water can be used for drinking purposes. The tanks can be interconnected to support a smaller community. This Water can be transported to the needy, food banks and homeless shelters as well if need be, thereby supporting the local society. Ice melts can be a major source of water to irrigate gardens or to power wash homes and cars. Underwater storage of water enables us to have cold water during hot summer months. This mode of collection and storage makes each home self sufficient in its uses of their finite resource. This system relieves the stress on community water supplies. Since our home has become the source of water, we can depend on ourselves and take care of ourselves. If each and everyone of us are able to collect rain water or the water collected from fog and are able to store it in barrels or underground, we may not have any water shortage anymore. We may NOT have to tap into large natural underground aquifers, destroy the Glaciers by tapping into them for drinking water or dig deep into the Earth draining this finite water resources. Everyone wins. Previous Post Being UPFRONT in Life. Next Post The Fire of HATRED.